On February 16, 1923, archaeologists opened King Tut’s tomb for the first time. This is what they saw. The world is fascinated with images of ancient Egypt, whether it’s in the form of countless movies about mummies or a classic photo of Louis Armstrong playing his trumpet in front of the Sphinx. It was on February 16, 1923, when the fabled King Tut’s tomb was opened, that Egyptian history first captured the imagination of the world. English archaeologist Howard Carter went to Egypt in 1891 with an inkling that there was at least one undiscovered — and therefore intact — tomb. The allure of the rich treasures with which Egyptian kings were laid to rest had led to prior discoveries of elaborate tombs, but thieves were the ones doing the plundering, not trained archaeologists. Therefore, the world had yet to see a burial that wasn’t robbed of its riches. In the early 1900s, there was evidence of a ruler named Tutankhamen who lived around 1400 B.C.E. and died while still a teenager, yet no one had found the physical tomb. Carter searched for five years, funded by the deep pockets of Lord George Edward Stanhope Molyneux Herbert, the fifth Earl of Carnarvon. Yet it was to no avail, and Lord Carnavon tried to cut Carter off. Luckily for Lord Carnavon, Carter was able to convince him to keep on funding for one more year. 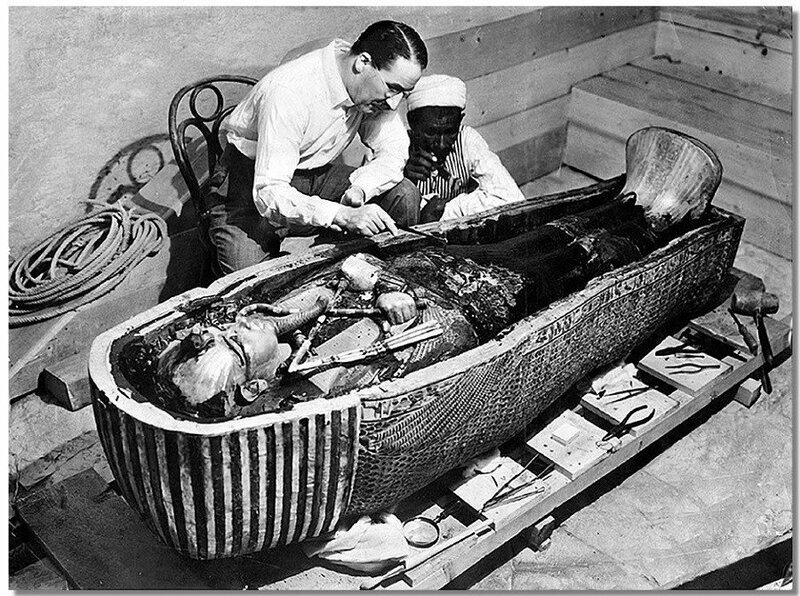 On November 26, 1922, Carter finally found King Tut’s tomb, which had been untouched for over 3,000 years. Carter and his team immediately began excavating the tomb’s four rooms. Finally, on February 16, 1923, in the last remaining unexplored room, Carter found Tut’s sarcophagus. The sarcophagus contained three coffins. The final coffin, made of solid gold, housed the most precious artifact of all: King Tut’s mummified body. The jewelry, weapons and riches found inside the tomb were valuable, but similar pieces had previously been discovered. Tutankhamen himself, however, was the first perfectly preserved mummy to ever be found. The discovery ignited an Egypt craze, bringing tourists to the country, starting a world tour of the body, and inspiring the global fashion market to imitate Egyptian art and lifestyle.